Although women make around 75% of journalism students, they are still a minority in the newsrooms. According to a recent report by Women’s Media Center, there are only 36% female journalists working in the newsrooms that remain dominated by male employees. The women also tend to appear less on the television as anchors and media experts, and they usually report the lifestyle while men are assigned political and technological topics. “Women are more than half of the population, but we don’t see or hear them in equal numbers to men,” responded to the report Julie Burton, president of the Women’s Media Center. In Europe, there are more women studying journalism than assigned in newsrooms Taking into consideration the number of female graduates and the amount of women actually working in the media, the general tendency shows that sexism prevails in most of the Western media. The gender quotas which are applied in various European countries and are meant to fix the gap between men and women have not solved the issue. 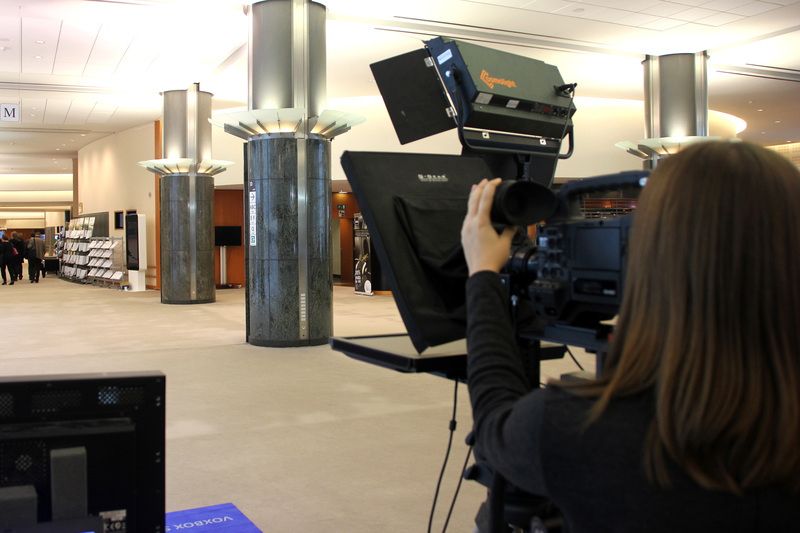 “In 2015, only 31% of the board members in EU public broadcasters are women. Only 19% of the highest-level boards are led or chaired by women and only 10% are CEOs” says Jolanda Reingarde, Senior Research Analyst with European Institute for Gender Equality. She is responsible for reviweing the implementation of the Beijing platform established for equalizing men and women and providing the latter with the equal rights. She states that media organizations do not follow the platform objectives. Jolanda Reingarde explains why media are not complying with the Beijing platform objectives and what actions should be taken in EU and national level (EN) “When it comes to equal opportunities or the treatment, women still have a very long way to go,” says journalist Rania Tzima. She covers politics for the biggest private TV-channel in Greece MEGA. After being in journalistic sphere for a long time, she admits that women have achieved a significant progress. However, they are still treated with less trust and are often assigned the tasks of less importance comparing to the topics men cover. “Sometimes, you are not given an assignment simply because you are a woman,” she adds. Ramia Tzima discusses equality in media salaries between men and women and describes how a professional achievement led a male journalist comment on her appearance (GR/EN) Tzima talks about the danger of giving away female characteristics in a male-dominated working environment and defending other women’s equality rights (GR/EN) The general focus on men shows the undermining issues regarding sexism in journalism. For instance, at the present moment, women make less than one fifth of all the experts interviewed by the journalists. They are also less likely to be featured on the front pages or be quoted for the political stories. Besides, there is still a lot of sexism whenever the women are being represented in the media. Political campaigns are good examples; whenever there are women participating in elections or acting as significant political figures, they tend to be singled out by the media through the sexist remarks. For instance, Angela Merkel has been called “black widow spider”, and American politician Hilary Clinton was referred as too old to participate in the presidential elections in 2016. There is a negative tendency of focusing on body parts or the appearances when talking about the women; and this is something absent from covering the men. Women tend to be portrayed differently from men, with a specific focus on the feminine qualities and traditional female features. “Women are usually presented as mothers and caretakers of the family,” says Ukrainian researcher Oksana Kis, “This contributes to the double harm for the women’s consciousness”. According to a researcher, sexist portrayal limits the women to a private sphere and separates them from the public life; and it also makes it look like the women need to follow the traditions and identify themselves with the stereotypical female roles only. Sexism remains strong when it comes to the job division inside the media sphere. Just as female reporters tend to be assigned “more feminine topics”, there is lack of balance in the news and other programs where female anchors are a minority. They make less than 10% of sports columnists strengthening the stereotype that sports is a male prerogative. Women are also less likely to get recognition for their work. For instance, in 2015, only four women out of 14 winners received the European Press Prize, which is an annual competition for the journalists. Despite some successful examples of women-anchors or women-reporters, there is also a gender gap when it comes to management roles. “Although there are more women in the intermediate positions, the majority of executives are men,” says Catalan journalist Laura Pus Trull, correspondent for the Catalan News Agency in Brussels. Laura Pous Trull talks about the lack of women journalists in leading positions and presents her view regarding women discrimination at work. (CAT/EN) She admits that women receive much more scrutiny than men in their appearances, and it is more difficult for them to secure assignments because they are treated with less trust and confidence. The greener the more equal Although the gender equality issue is a solid problem, it does not get the necessary coverage. With the many crises affecting the EU, the problems of sexism and women’s roles has dropped out of the priority list. Solving the gender gap can lead to positive consequences in the media sphere as well as help European journalists to work more professionally; however, as long as this problem is not recognized, the two sexes are deemed to have unequal opportunities and representation. This article was produced in a workshop at European Youth Media Days 2015.